Hmm, why would Captain America be wearing his first Avengers suit in this Avengers 4 set pic? Brace yourself, Marvel fans: a set pic of the still-untitled Avengers: Endgame could contain spoilers for the upcoming Avengers: Infinity War. 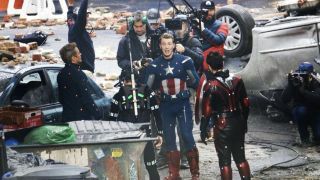 TMZ has new candid photos of the movie being filmed, and it shows several of the MCU heroes gathered somewhere with rubble lying all around them. At first glance, this would seem to be a relatively inconsequential picture showing a meeting between fellow Avengers. Possibly to discuss strategy or just a rallying "rah rah!" moment. But take a closer look at Cap's uniform: it's the one he wore during the first Avengers. So either we're looking at a scene filmed out of order - chronologically speaking - or after becoming all broody and bearded, Steve Rogers decides to shave his beard and go back to his 2012 outfit. Some have been quick to suggest this means Cap bites the dust in Infinity War (after all, co-directors Joe and Anthony Russo have been saying for some time now not everyone will make it out of the third Avengers film alive), and what we're seeing now is a flashback - but I'm not so sure. It looks like Cap is speaking to Tony Stark, Ant-Man, and though it's not clear from this angle, that person in mocap is Mark Ruffalo standing in as his green alter-ego, Hulk. Rogers has long been acquainted with Stark and Bruce Banner, but Ant-Man didn't come into the picture until Civil War. They even made a joke scene about Ant-Man being awkward when the two of them met for the first time. So what's he doing here, and why is Stark wearing a jacket with the SHIELD logo on it? And why do all the actors, even the ones already in costume, have those mocap dots all over them? So many questions!